New Jersey's first counties were created following the 1676 division of the colony into the Provinces of East and West Jersey after Lord John Berkeley sold his half of the colony to a group of Quakers led by John Fenwick. The Quaker-owned western section comprised what was then known as Burlington and Salem counties; East Jersey was divided into Bergen, Essex, Middlesex, and Monmouth counties. In later years, after the two provinces were again united, the original six counties were divided over time to form fifteen new counties, eventually making up the twenty-one counties of the current state. Even after re-unification into a single colony, the counties of the former West Jersey retained some heritage of their period under Quaker governance, such as the use of large townships as the most frequent municipal plan of government and providing county government with greater responsibilities than was typical in the East Jersey counties, which were more oriented to home rule traditions recognizing the autonomy of boroughs, villages and towns. The most frequent source for the names of New Jersey counties are place names in England (Burlington, Camden, Cumberland, Essex, Gloucester, Sussex, Monmouth, Middlesex, Salem, Somerset, Sussex, Warren). 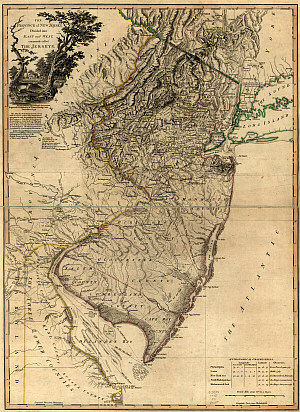 Other counties derived names from prominent explorers (Hudson, Cape May); geographic features (Atlantic, Ocean); colonial governors (Morris, named after Royal Governor Lewis Morris); and revolutionary leaders (Mercer, named after General Hugh Mercer, mortally wounded in the Battle of Princeton). Passaic County is adapted from the Lenni Lenape word "pahsayèk," usually translated as "valley." The name of Union County, formerly part of Essex and the last county to be established in 1857, reflects an affirmation of the national union in the years of dissension leading to the Civil War. The origin of Bergen County's name is in some dispute, with most believing it comes from the Netherlands, the origin of many of its first settlers, but others contending it refers to a Norwegian town or early settler to Nieuw Amsterdam. The term "freeholder" still used for those elected to the governing bodies of counties also dates to colonial times and is unique to New Jersey. It refers to qualifications for voters and office holders which required that they had property worth fifty pounds and had resided in the county for 12 months preceding the election. Thus, the "board of chosen freeholders," the description still used for some county governing bodies, means the entity comprised of representatives elected by the county's voters. Counties with the largest populations in the 2010 US Census were Bergen (905,116); Middlesex (809,858); Essex (783,969); and Hudson (634,266). The smallest populations were reported in Salem (66,083); Cape May (97,265); Hunterdon (128,349); and Sussex (149,265). ﻿Gloucester County had the highest rate of population growth in New Jersey from 2000 to 2010; its 13.2% increase was substantially greater than the 4.5% growth recorded statewide. The population of nine other New Jersey counties grew faster than the state during the 2000-2010 period: Ocean (12.8%), Somerset (8.7%), Atlantic (8.7%), Middlesex (8.0%), Cumberland (7.1%), Warren (6.1%), Burlington (6.0%), Hunterdon (5.2%) and Morris (4.7%). Ocean County had the largest net population increase (+65,651) in the state from 2000 to 2010, followed by Middlesex (+59,696), Gloucester (+33,615), Somerset (+25,954), Burlington (+25,340), and Hudson (+25,291) counties. Together, these six counties accounted for more than 62% of the state’s total population growth. According to US Census Bureau estimates for 2014, Cape May residents are the oldest, with a median age of 48.4 years and 23.7% of its population aged 65 years or older; Hudson is the youngest at a median age of 34.6 years and 10.7% of its population 65 or older. Based on the 2014 US Census Bureau estimates, counties with the highest estimated racial percentages of their total population classified as white were Sussex (93.5%); Ocean (91.8%); Hunterdon (91.2%); Cape May (90.4%); and Warren (90.2%). The highest African American percentages were in Essex (40.6%); Union (21.2%); Camden (20.2%); and Mercer (19.9%). Hispanics (which can be of any race) were highest as a proportion of total population in Hudson (42.9%); Passaic (38.9%); Union (28.9%); and Cumberland (28.6%). Asians had their highest percentages in Middlesex (22.9%); Somerset (15.9%); Bergen (15.8%); and Hudson (14.6%). Of the twenty counties in the nation with the highest median household income according to the 2013 survey by the US Census Bureau, four were in New Jersey: #4 Hunterdon ($105,950); #7 Somerset ($95,825); #10 Morris ($98,401); and #20 Sussex ($87,342). The lowest household incomes were in Cape May ($40,506); Cumberland ($48,694); Essex ($52,762); and Atlantic ($54,235). Sixteen of the 21 counties continue to have as their governing body the board of chosen freeholders, whose members perform both legislative and executive functions, with each freeholder assigned responsibility for a department or group of departments. Under legislation enacted in the 1970s, five counties--Atlantic, Bergen, Essex, Hudson and Mercer--have chosen to revise their charters by creating an elected county executive position as the chief administrator of the county subject to oversight by the freeholder board. In these counties, the freeholder boards continue to act as legislative bodies. In counties without an executive, the freeholder board may retain a county administrator or manager to assist in administration of county programs and operations. Union County has a county executive that is appointed by the board, analogous to the council–manager municipal form of government. All counties in New Jersey hold organizational meetings on or soon after New Year's Day. At this time the boards elect members to leadership positions on the boards, with the top post usually described as director or chair. In most cases, the organizational meetings also serve as the time when freeholders are assigned as liaison to one or more county departments. Counties have no direct power over the municipalities within their jurisdiction. They are involved, however, in the annual calculation and equalization of local property tax rates, in which the projected expenses of the county government are added to the budget of municipal governments and school districts to determine the final tax rate for property owners. The collection of taxes, however, is the responsibility of each municipality. Appeals of property taxes are first submitted to county tax boards, whose part-time members are appointed by the governor, with further appeals to the Superior Court. Some counties also have assumed former responsibilities of municipalities, such as in solid waste collection and disposal, health inspections and property appraisals. Several counties also operate county parks, recycling and recreation programs, and a few have established county housing and economic development agencies. Counties traditionally perform state-mandated duties such as the maintenance of jails and construction and maintenance of certain highways and roads. Recently, the counties of Bergen and Camden have established county police forces, either to complement or replace local police. The municipality which serves as the site of a county's government, administration and courts is called the county seat. The county prosecutor is a constitutional officer, nominated and appointed by the governor with the consent of the state Senate. County prosecutors and their staffs serve as trial attorneys prosecuting felonies and other serious cases beyond the jurisdiction of municipal courts. They also are empowered to investigate and refer cases to county grand juries for potential indictment. In rare situations, prosecution of cases normally within the jurisdiction of the county prosecutor may be taken over by the state Attorney General. In addition to freeholders and county executives, the other elected offices of counties are the county clerk, sheriff and surrogate. The county clerk is responsible for the administration of services including the filing and recording of all documents affecting real estate ownership and transfer, the processing of US passport applications, the issuance of identification cards, the filing of business trade names, and the supervision of voter registration and elections. The surrogate primarily deals with the administration of wills and estates, including qualifying executors and administrators to administer estates and overseeing distribution of a decedent's assets. The Surrogate is also responsible for appointment of guardians for incapacitated persons; actions to remove fiduciaries; the review and certification of adoptions; and the custody of funds held in escrow for minors. The origins of the sheriff date to medieval England, when the sheriff was the principal law enforcement officer within the common law system. The law enforcement role of the sheriff has diminished in New Jersey, with the current responsibilities largely in the sale of property through foreclosures; the provision of security in courts; and the operation of county jails and prisons. The sheriff's position in New Jersey also often has become an important base of political power, with sheriffs using patronage and other tools to exercise influence in statewide and local elections. Historically, counties have played significant political roles in New Jersey politics. Within the county, elected officials and party leaders have exercised leverage in the distribution of patronage through jobs and the award of contracts. Statewide, county political leaders have also been influential in the nomination of candidates for governor and the US Senate. Such famed political bosses as Enoch "Nucky" Johnson in Atlantic for the Republicans and Frank Hague in Hudson for the Democrats are only two examples of those who demonstrated power over many years in shaping state, and on occasion, national politics beyond their county base. Until the 1960s, the New Jersey Senate was composed of 21 senators, with one from each county regardless of population. Following the "one man, one vote" decision in 1964 of the US Supreme Court in the case of Reynolds v. Sims that state legislative districts must be approximately equal in size, the New Jersey system was declared unconstitutional and the state revised its districting to establish 40 districts statewide, each represented by one senator and two assembly members, without relation to county boundaries. While the abolition of the former system in which each county was represented by its own senator has somewhat weakened the county's political leverage, county political party committees and their chairs continue to play significant political roles. The chairs, often popularly known as "bosses," have significant influence in the selection of candidates for municipal, county and state offices through their control of the "line" on ballot positions in primary elections designating candidates who are running with the backing of the county party committee and by providing significant funds, workers and other resources in support of their favored candidates. Other sources of county political power are derived from their input in the gubernatorial nomination of judges and prosecutors; potential employment by county residents in state government positions; and in county government employment and contract awards.